Looks like I might have a fairly regular Saturday night gig. A guy who runs an open mic wants to get it a bit more organized so is planning to come up with a set list to play. His plan is to print up lyrics with chord rather than do a fly by the seat of your pants thing to make it easier for others to join in. He has asked me to join him to run it up the flagpole. It will mostly be 1960s rock stuff like Paint It Black, Fortunate Son, Norwegian Wood as well as some blues like Key to the Highway (Big Bill Broonzy style). I am supposed to meet him Friday night to start working on it. Might be cool. Here is a photo from last Saturday night. I am the guy with his back to the camera. Sorry, no Gibson. That particularly night I was playing a Harmony. When we play out (two gigs this weekend), friends will come up impromptu and sing and play a tune or four. Routinely. Its a great tradition... its very social and establishes emotional connection between performers and spectators - no barrier. Its also smart because it can help in driving attendance. You are at a higher level musically than I am for sure. I think its great that you would do this. Nice ZW - sounds like a pretty fun way to go. Hopefully you'll be able to sprinkle some of that 12 string blues you got going on... (or is that 'keys to the highway?). Hope it works out, I started out in open mic's too. Looks like you'll have some fun with this, zw! Not quite starting out - I played my first gig in the mid-1960s. More like wanting to play in front of people one last time so allowing myself to be coaxed out of my self-imposed exile. I have had to come to realization that if I want to play with others I will have to play what folks want to hear. So I am pretty open although you are not about to hear me play any John Denver songs any time soon. For me playing out means pretty much anything outside of my living room with an audience. I have not played for money since the 1970s although I will always take free food. Money would make it a job again. When it became a job (I was playing in a band, doing some backing work, and teaching music at a small arts center) it took the fun right out of it. 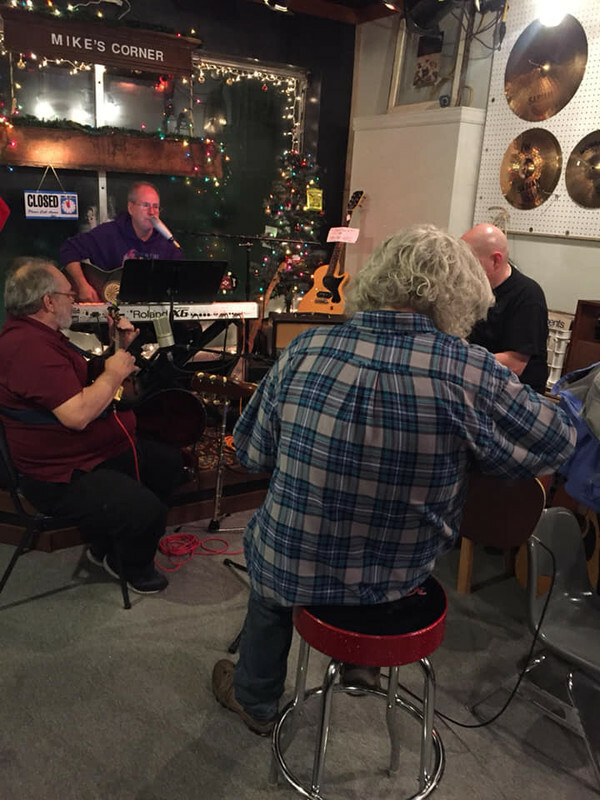 Having other folks join-in is a good idea, especially for newbies to the "open mic" scene. Being part of a group is a good way to calm down nerves. I hope getting-back into playing gigs is real good for you. Aside from being fun, I think it's good therapy for the different stages of our lives. My mom died just after Thanksgiving and I had two friends who covered my regular gigs about three weeks. Just got back in the groove on Wednesday and realized that I not only missed it, but also needed the connection. Judging by your pic, looks like an enjoyable place to play. Nothing last forever and your pic looks like one of those things we wish would last. Bingo Brother! When I played I could shut my brain off and everything would go away for a bit. My hands just took over and would do things I did not know they could do. And it is a whole lot more fun playing with others than by your lonesome. I am way out of practice though right now. The guy who runs the open mic will humor me and include stuff like Blind Willie McTell's "Searching the Desert," Josh White's "One Meatball" and Leadbelly's "John Hardy." We will grab some of the tunes we have already been playing like CCR's "Born on the Bayou." Last week I thought the best thing we did was the Beatles "I'll Cry Instead" so that will probably make a reappearance. The nice thing about playing with a bunch of others is that nobody can hear your mistakes. Taken all together, everybody sounds great! Aw, shucks - and all this time I thought it just inspired musical excellence. Seriously, I agree, and that makes it nice for everybody! I'd like to put a jam / open mic together with some of the older locals around here. We have one here that has been going on probably 40 years now. They hold it twice a month during the spring, summer and fall (no heat in the place)and it has become so popular they have three rooms going at the same time and it is still SRO. There is so much white hair and beards around it looks like a Santa convention. There is so much white hair and beards around it looks like a Santa convention. Who brings the cookies and milk ?